On a frigid February night in New Hampshire the car Penny is riding in loses control and crashes passenger-side first into a tree. When she wakes up the next morning she can’t understand why her mother and sister are ignoring her, until she accidentally sticks her hand through her mother and remembers the night before. A town away, Will is going about his senior year of high school on autopilot. He can’t work up the courage to tell his overbearing father that he doesn’t want to go to Boston College and study Business, his ex-girlfriend doesn’t understand the concept of being broken up, and he’s tired of feeling like his life is all an act. Thinking she’s dead and wishing for a respite from her family’s grief, Penny is drawn to a house party where she meets Will, who miraculously can see her though no one else can. In the off-limits living room at the back of the house, with music thumping and their peers making fools of themselves nearby, Penny and Will begin a relationship that will make both of them question the decisions that have brought them to where they are and force them to jointly take a leap of faith. It's a well-known fact here at I'd So Rather Be Reading that I don't read stories with ghosts in them. Not at all. Not ever! So, when Stephanie Blackburn contacted me for a possible review of I Want to Hold Your Hand the first question I had after reading the summary was, "Is Penny a ghost?" She assured me that there was nothing in the story that would scare me and that it's more of a contemporary story than a paranormal fiction. And she was right: after I got over my initial discomfort about Penny's ghost-like status, I ended up really enjoying I Want to Hold Your Hand. I liked that Penny is such a driven person: she's a gifted athlete (she rides horses), and spends all of her free time training for her horse competitions. One night on the way home from practice, Penny and her mom are in a wreck. She wakes up the next day, but no one can see or hear her (except for her sister's cat and her horse, Henry). Penny thinks she's dead and that she's a ghost. She ends up on a private school campus, and meets Will. The best thing about Will in the beginning is simply that he can see and hear Penny. Then the two become friends, and while they end up having feelings for each other, their relationship is an impossibility due to the fact that they can't touch. What I loved about this story is how Blackburn resolves the conflict. I totally didn't see the ending coming, and I loved the surprise and the way she wrapped things up. I loved that Penny changed throughout the story and by the end of the book, she was a different person---both literally and figuratively. 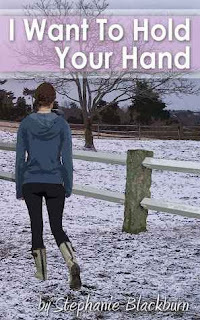 I Want to Hold Your Hand read like a contemporary YA fiction with a twist. I really enjoyed it, and would definitely recommend this book!